Reverend Jacek Wozny was born on September 10, 1961 in Zbaszynek, Poland. After graduating from high school, he studied fine arts at the Academy of Art in Poznan. Following three years of art school, he began his education in the Catholic Seminary of Goscikowo-Paradyz. He graduated from the seminary in 1988 and on June 5th of the same year, he was ordained a priest. In 2002, Rev. Jacek Wozny immigrated to the United States of America. Since then, he has worked as a priest in the Archidiocese of New York. During this time he has worked at both St. Stanislaus Kostka Church and St. Ann’s Church (bot located in Staten Island). On September 1, 2010, at the jurisdiction of Cardinal Timothy Dolan, Rev. 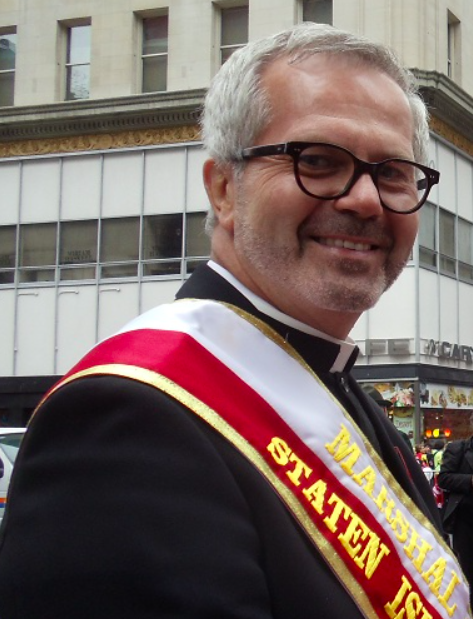 Jacek Wozny was transferred back to St. Stanislaus Kostka as administrator. On September 1, 2011, one year later, he was officially promoted to pastor of St. Stanislaus. Since coming to the United States, Rev. Jacek Wozny has distinguished himself with his exceptionally passionate work for the Polish community. Upon joining St. Stanislaus, he organized and taught art classes for young parishioners. These classes continue today – ten years after their inception. His leadership in the role gained the students several awards in local art competitions. These included competitions sponsored and organized by Mayor Bloomberg, Staten Island Borough President Guy Molinari, the Archdiocese of New York, and CYO Staten Island, just to name a few. In 2008, Rev. Jacek Wozny was himself recognized by CYO Staten Island for his continued work with the children and youth of his community. Rev. Jacek Wozny has collaborated with several charities. He is committed to continuing his efforts with the Polish youth, as well as within the Polish community – all in the hope of enriching Polish values and culture.